Maria Montessori brought carefully selected materials into her classroom and further developed those materials to support complex learning outcomes. 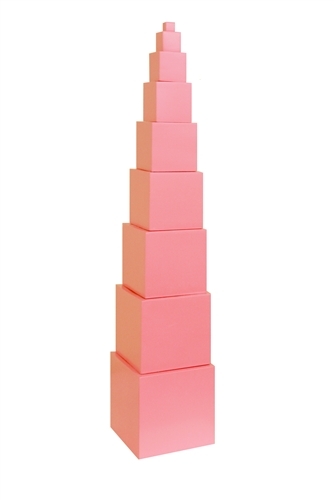 The most widely recognized Montessori material is the Pink Tower. 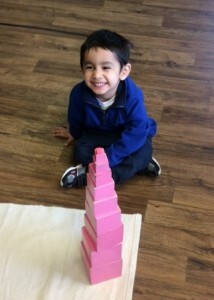 At first glance, the Pink Tower may look like a simple set of blocks, but Dr. Montessori had many goals in mind when she constructed and developed this material. The Pink Tower introduces a number of concepts to students through hands-on manipulation. The pink tower consists of 10 cubes, as 20 is the basis of the metre system. 64 of the smallest cube make the fourth cube, etc. Montessori materials are treated with great respect within the classroom. These items are special and handled with care. For example, the pink tower is never knocked down once assembled. The student will carefully disassemble the tower in order to return the material to the shelf. – The Teacher will invite a student to have a lesson on the Pink Tower. The invitation enables the teacher to gauge the child’s interest. – Together, student and Teacher will lay out a mat. – The teacher demonstrates how to carry the cubes – one at a time – with both hands. Grasping with two hands enables the child to feel the difference in size of each cube. 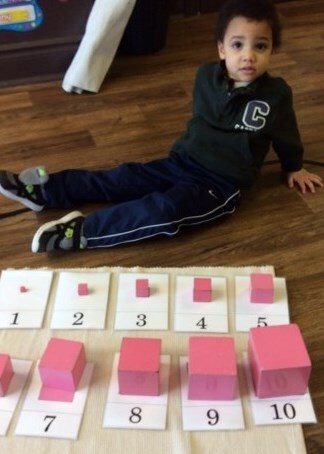 – The Teacher sits beside the child and carefully examines each cube. She then chooses the largest block – deliberately – then selects the next largest and places it on top. – In pausing between each cube selection, the Teacher models the importance of taking the time to inspect each cube in order to make the correct selection. – There is a natural control of error in the Pink Tower. If the child does not build the tower in the correct order, the tower will fall. An authentic Montessori classroom will always include the pink tower and other recognizable tactile materials openly available to students on low shelves within the prepared classroom environment. Watch for upcoming blogs where we will share details on additional Montessori materials and how children learn from these instruments. Beyond Core Curriculum – Music Enrichment at Kendalwood Montessori What is Montessori?